One of the projects I'm required to take care of at work is to securely destroy old HDDs. Now we are a nonprofit operation so an industrial shredder isn't an option. So I decided to use some time at work to confirm a theory I had. 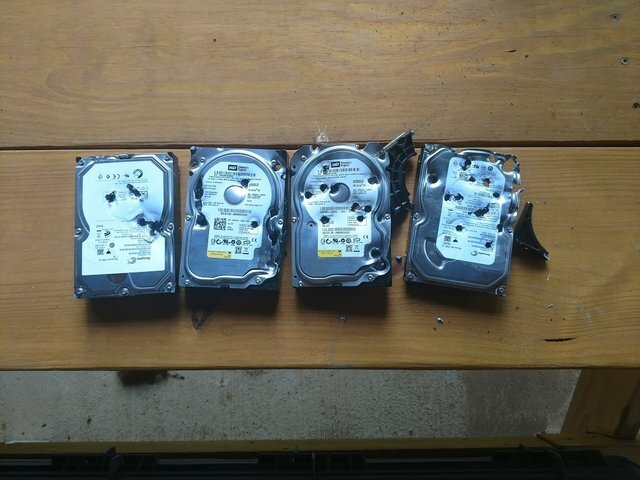 As long as you destroy the majority of an HDD platter, its worthless for recovery, a common online suggestion is drill or spike the drive platter in 3 places. First though I have is "3 holes? Shoot, I can do better than that, by shooting it XD"
I take them to the range and proceeded to confirm my suspicion, .22LR will do just as good as a drill, better if you have a semi-auto rifle and lots of ammo. It's even therapeutic! I do need to go over the left 2 again, my friend who is new to shooting worked on those and got substantially better on sighting. I love American and our freedoms! I like your recycle method, 22LR is plenty; but I might have to use some heavier calibres, JUST FOR FUN, LOL! An oil company decided to upgrade their office computers. The office is a 14 story building, so it was a significant problem. They came up with a novel solution, they would sell them to their employees, for a modest price. The employees then got to go to the roof, put on a safety line, walk to the edge, and throw their old computer as far as they wished! They sold monitors and printers too; and all the proceeds went to united way! They had a gold recovery company that cleaned up the debris for the recycle costs! They partied all afternoon, and catered lunch; everyone was better for the diversion! We designed some new medical monitors, and the prototype circuit boards need to be destroyed so they can not accidentally get into production. I took my engineering group out to the gun club, and we used a similar method to off them. It had been a very hard project, and we needed to celebrate! We had a cook out with cold watermellon, and blew them to perdition, ROFLOL! hahahahahaha two birds, one.... bullet.